This is that time of the year when many people are realizing they could lead a better healthier lifestyle. New Year is coming and fitness resolutions are on many’s do-to lists for 2015. But also people don’t always commit to it even having a gym membership. Their reasons for this differ but some mention lack of time. Well, this one is easy to solve (sorry) by working out at home. It’s easy, you have twenty minutes a day when you just browse through your social media or watch TV. 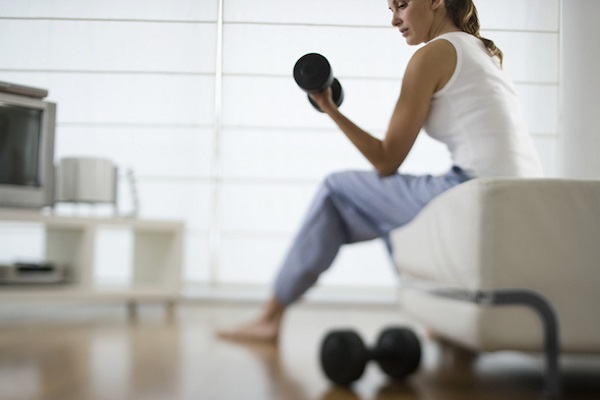 You could use this time for a high intensity workout. Here goes an exuse that these short bouts of exercise won’t work, because: a) in twenty minutes you can do a lot and b) when you perform difficult exercises back to back with little to no rest you can really work up the sweat. Combining strength moves with cardio and plyo exercises you will work your muscles, your heart, and your respiratory system. This is in fact a very effective way to shed fat and tone up those muscles. A home gym might be seem like luxury but when you start you really don’t need much. You can forgo a cardio machine by increasing your walking distances and instead invest in some weights that you can store under your bed or inside your closet. Kettlebells are worth investing into as they work lots of muscles and can be used in HIIT workouts. 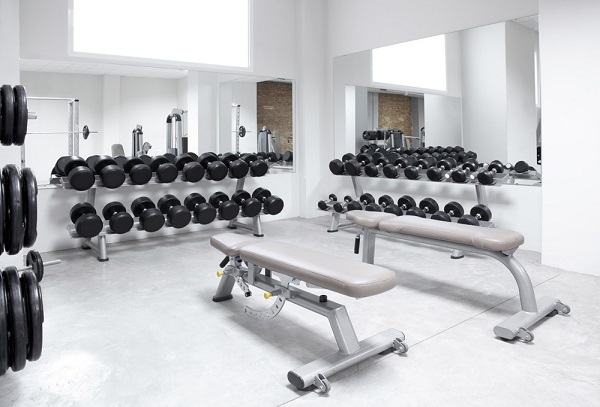 A barbell will require lots of different weights especially as you progress so if you aren’t building a full-fledged gym at home or have enough space for all of that it’s better to invest in some dumbbells. You can use them for all kinds of exercises including squats and deadlifts. Resistance bands is also a great equipment for working with your own bodyweight, while a fitness sandbag can be used as a barbell in a squat or deadlift. You can add sand as you progress and it’s quite cheap. There is definitely an advantage working out at home. You spend less time traveling to the gym, you can work out all alone without distractions, you have an instant access to the kitchen (which can be both a good and a bad thing). While all of this is good, not being able to learn new techniques and use as much different equipment as possible may be a drawback. Not being able to have someone correct your technique can lead to injury and not having the atmosphere and community to motivate you can also be a con. But these things are just pluses and minuses. You can change that by watching videos and taking some personal sessions to learn exercise techniques. In the end of the day, if you want a good looking healthy body, you gotta do something. A healthy diet is an implied thing, of course. Now, what if you “can’t” work out at home? Well, here are some inconspicuous office exercises. This entry was posted in Motivation and tagged bodyweight training, gym, strength training. Bookmark the permalink.